Let’s all gear up with the festival of amazing gadget deals. Start hyping up the party by check out these hot Flash Sale deals for Lazada’s 6th Birthday Sale today. 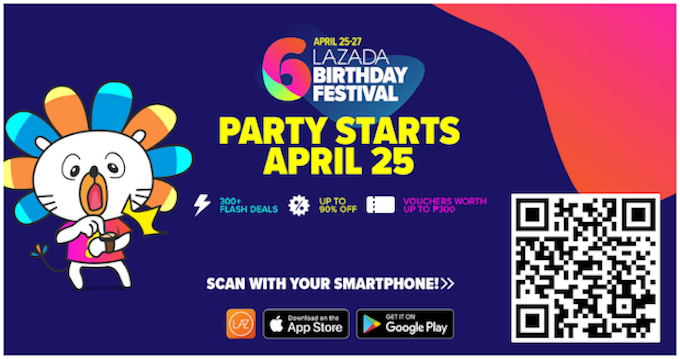 The Lazada 3-day Birthday Festival Sale will start today, April 25 to April 27, 2018, only. So, don’t miss an hour to check amazing deals for new electronics and gadgets. To make it easier for you, here are a collection of items on their flash sale. To make connecting faster and more convenient for you, open your QR code scanner app and scan the QR code below to redirect you to Lazada’s biggest birthday festival sale. What are you waiting for? Get the most out of this amazing flash sale deal from the biggest online shopping destination, Lazada, as they celebrate its 6th birthday festival anniversary sale this year. Check other items with great discounts for the best gadgets deal and avail up to 90% discount. Visit www.lazada.com.ph today!